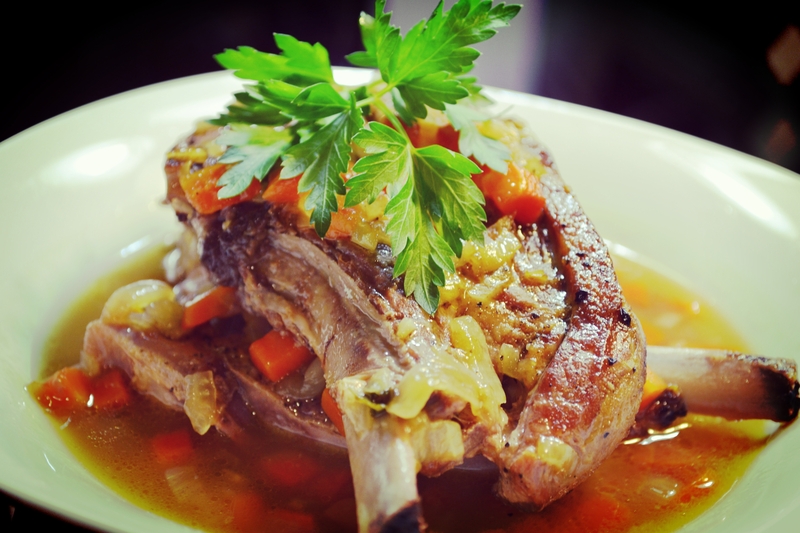 Lamb are usually a special treat, displayed proudly on menus from formal occasions. However, they can also be a comfort dish, served for dinner on a cold winter night. 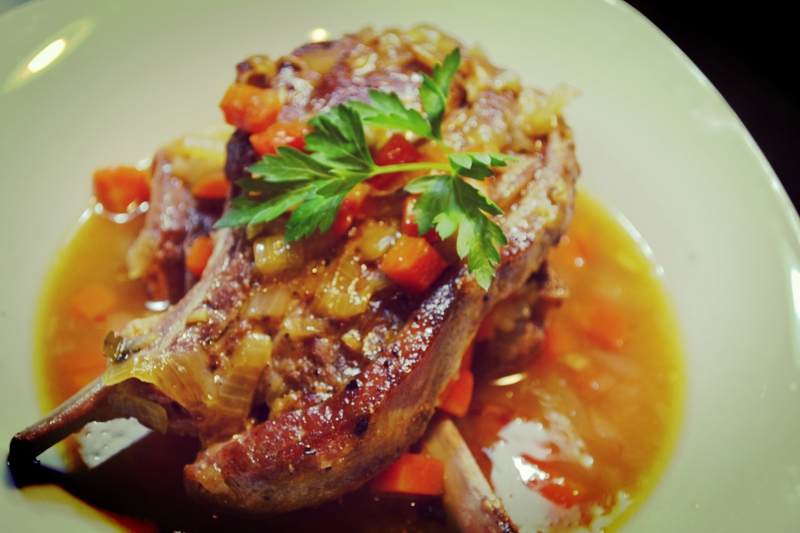 Lamb Shoulder Braised in White Wine combines simple household ingredients in a warm pot full of decadent flavors. 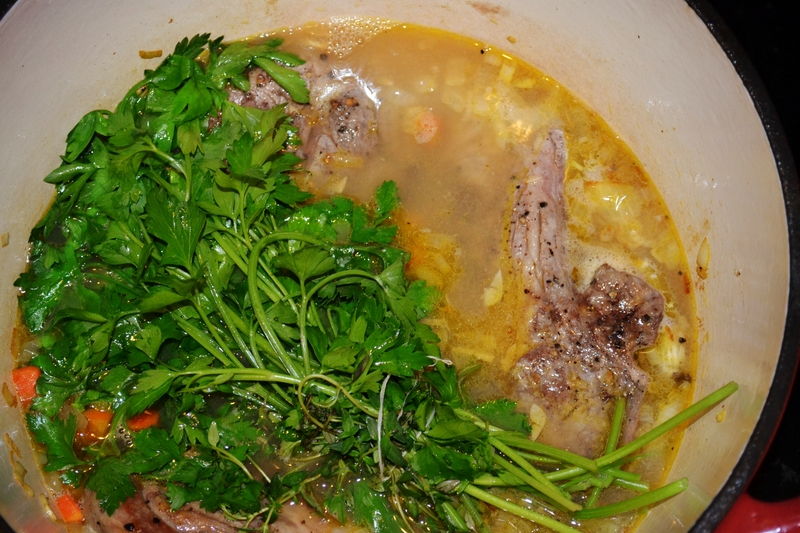 Lamb shoulder is seared, then braised in white wine, stock, and herbs. 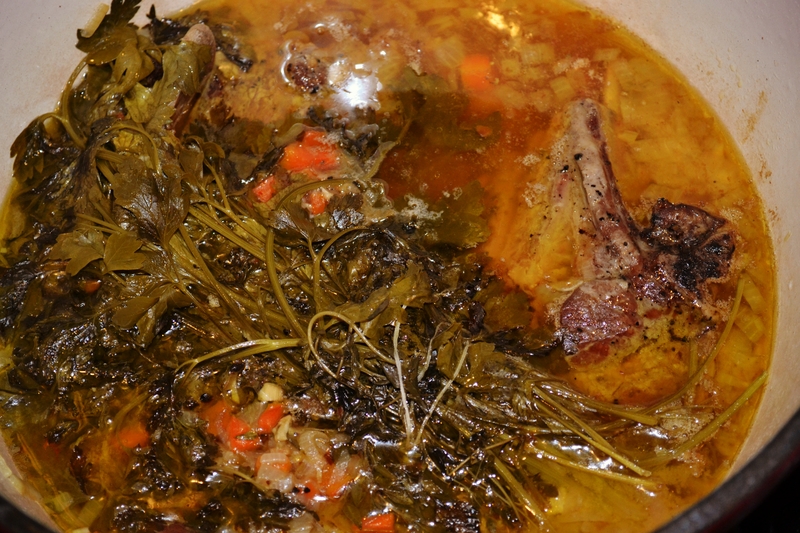 The simmering process creates a tender and fall-of-the-bone result. The best part is, your stove will do most of the work. This recipe will work with beef as well. Enjoy! 2. Heat a large pan in high heat. Add about 3 tablespoons of oil. 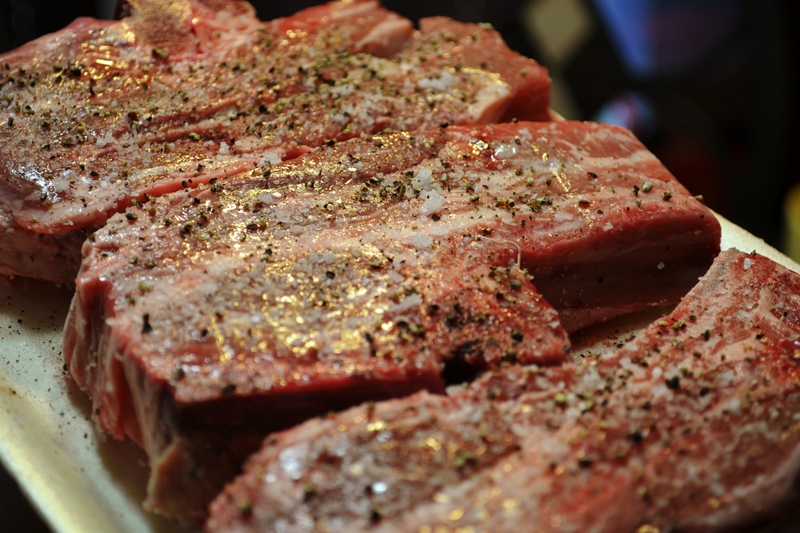 You want a pan large enough to layer your meat in one layer without crowding. Pan should be oven proof, and has a lid. I used my dutch oven. 3. 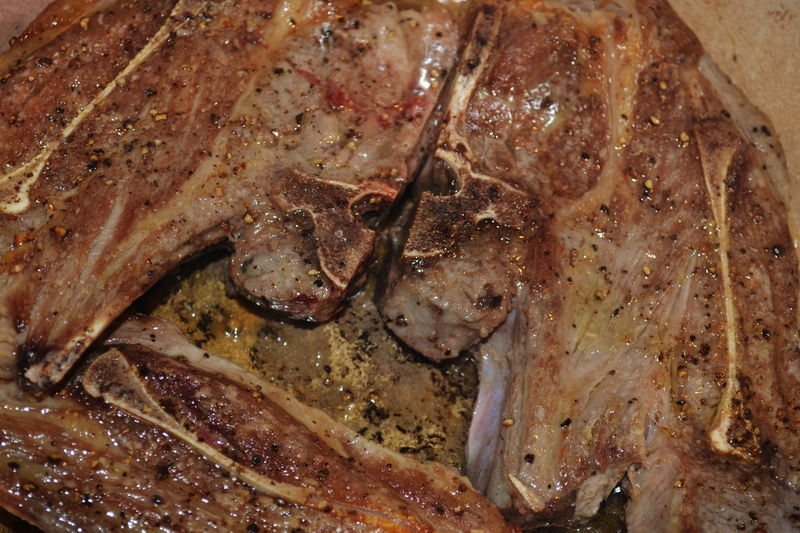 Sear both sides of your meat to get that golden brown color on the outside. About 4 minutes each side. 4. Transfer the seared lamb to a plate. 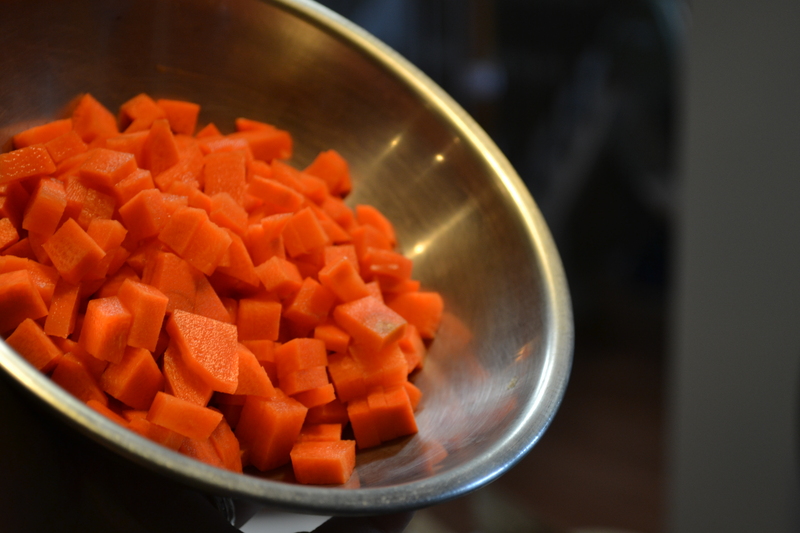 Using the same oil, add your carrots, onion, bay leaves, and garlic. Sautéed on medium heat for about 10 minutes. Be sure to get all the brown bits from the bottom of the pan mixed into your vegetables. 5. Bring your lamb back into the pot and tuck it in between the vegetable mixture. 6. Tie your parsley and thyme into one bunch using cooking twines. I couldn’t find mine so I used sewing threads. Make sure you tie it carefully so it won’t break and loosen when cooking. 7. Add your bouquet of herbs to the pot along with the wines and stock. 8. Tear a piece of aluminum foil large enough to cover your pot and lay it right above the meat and vegetable mixture, inside your pot. The cover the pot with a lid. 9. Lower your heat to medium low and simmer for 2 hours. Try not to remove the lid while you wait. 10. After 2 hours, your meat should be nice and tender. Using a ladle, remove the fat from above the broth. Remove as much as you can. 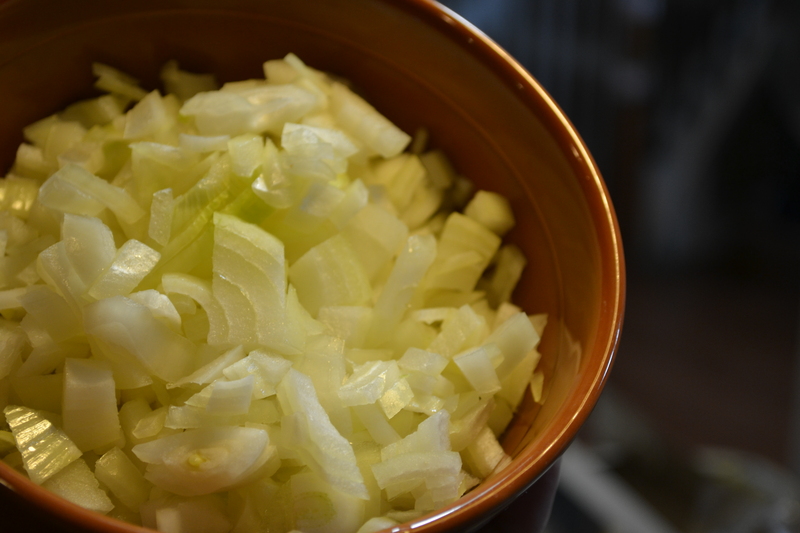 To make it easier, you can also pour the broth to a clear bowl and ladle out the fat from there, then transfer the grease-free broth back into the pot. 11. Remove the lid, aluminum foil, and bouquet of herbs from the pot. Place your pot in a 400 degrees oven and bake for 30 more minutes. 12. You’re done. Enjoy! Let me know how it goes.